Expect a big ball of wibbily wobbily timey wimey stuff under your tree this holiday season. 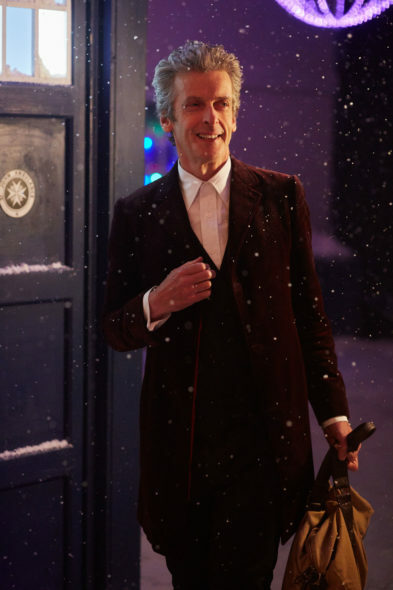 Below, watch a teaser for the Doctor Who TV show’s 2016 Christmas Special. BBC America has released it for New York Comic Con. This Christmas, the Doctor will be back in “The Return of Doctor Mysterio,” written by showrunner Steven Moffat. The “first look” trailer features Peter Capaldi, Matt Lucas, Justin Chatwin, and Charity Wakefield. It’s one of the most celebrated Doctor Who adventures and yet no complete film recordings of The Power of the Daleks are known to have survived. The master negatives were destroyed in an archive purge in 1974. A brand new animation based on the program’s original audio recordings, surviving photographs and film clips will be released 50 years after its only UK broadcast. The six-part adventure features the regeneration, or as it was then called ‘renewal’, of first Doctor, William Hartnell into second Doctor, Patrick Troughton, as the Time Lord and his companions Polly (Anneke Wills) and Ben (Michael Craze) do battle with the Daleks on the planet Vulcan. What do you think? Will you watch “The Power of the Daleks” re-creation? Do you plan to catch the Doctor Who TV series Christmas special? Let us know, below.